While the offensive free agent class is shaping up to be a dud, the defensive class looks like an all-timer. That is, before the franchise tags hit. There are a handful of legitimate franchise-altering talents headed towards free agency, but will they be too important for their respective teams to let slip away for a simple compensatory pick? Rarely do future Hall of Famers hit free agency. Even ones that are 30 years old. Odds are the Seahawks franchise him, as that price tag is likely far less than he’ll get on the open market. If he does hit free agency though, he’ll be in high demand even despite his injury. He had a 90.0-plus grade before going on IR. The Cowboys asked Lawrence to prove it in 2018, and he did just that. Lawrence earned an 89.5 grade this season after a career year in 2017. He’s no one-year wonder at this point. After Olivier Vernon got a monstrous deal for less production, odds are Lawrence breaks the bank. It wasn’t a banner year for Collins, but we’ve seen more than enough from him in the past to know he’s capable of elite safety play. He earned grades of 82.3 and 81.7 in the two seasons prior to 2018. He’s a versatile piece to any defense that can seamlessly move from deep safety to thin the box. Not many players on this list are hitting free agency with career years, but Flowers qualifies as one of them. His 90.4 overall grade is far and away a career high. Flowers has been the Patriots’ best defensive linemen for a few years now but took his game to another level in 2018. He can play outside on early downs then kick inside as a pass-rusher and still be effective. Yet another late rounder from the 2015 draft who’s vastly outperformed his draft status. While he only tips the scales at 300 pounds on a good day, Jarrett can hold up anywhere on the interior of the defensive line and still be effective. He’s notched 143 pressures over the last three seasons on the interior. He’s in line for a big pay day. The hype for the former number one overall pick has never quite matched the production. His 79.1 overall grade this past season is actually a career high. He’s always been a much better run defender than pass-rusher, as he’s never quite developed the ability to win the edge. Still, he can take over games against the run and will be coveted highly for his potential. If this were his second contract, Graham would be much higher on the list. The former first-rounder will turn 31 before next season, though, and it’s worth questioning how long he can keep up his ridiculous production. 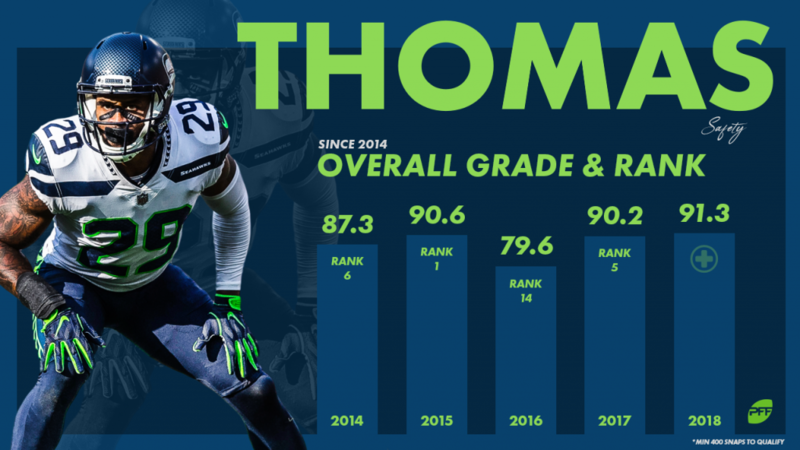 He earned grades over 90.0 in 2016 and 2017 but slipped back a bit as a pass-rusher to 88.7 overall this past year. That’s still going to make a huge impact on any defense that has him in the upcoming seasons. Ford is the wild card of this free agent class. He had four mediocre seasons after being selected in the first round of the 2014 draft with splashes of dominance intermixed in between. Those flashes started showing up weekly though this past season when he notched 15 sacks, 17 hits and 46 hurries. All three of those figures were far and away career-highs, and he’ll likely be this season’s Demarcus Lawrence who needs a prove it year before he gets a long term deal. The free agent cornerback class isn’t anything special this season, which bodes well for the Eagles cornerback. Darby ended up on IR after going down in Week 10 against the Cowboys, but he has the track record to get big money. He’s allowed a passer rating of 84.5 over the course of his career and only allowed a completion percentage against of 53.7 in 2017.